A new fan-made video of Terminator 2: Judgment Day done in a GTA V mod shows us what Hollywood would look like if Skynet took over. Terminator 2 was a huge hit when it came out in 1991 and was also a special effects tour de force with the use of groundbreaking CGI for the time. Grand Theft Auto V was released in 2013, becoming one of the fastest selling video games (and products) in history, earning over $8 million in 24 hours. There has yet to be a follow up released for the game and it is still massively popular for the online play and the creativity of fans going inside the game and altering the content in order to make the game operate in a new manner, aka modding the game. While these mods mixed with animating clips of movies or television shows are nothing new, this version of Terminator 2 is a work of art. For one, it's an hour long and it covers all of the major plot points in the movie. Two, the editing is pretty spot-on with the use of the original sounds and dialogue and even includes "You Could Be Mine" by Guns N' Roses. And three, the attention to detail is really something to behold. The amount of time that went into this project has to be obscene. The video, which could go down in history as the greatest GTA V mod ever, is on YouTube via Kramer's Media. The mod was created in Moscow and was originally dubbed all in Russian, so for those complaining that the voices are not in sync, that's the reason why. The uploader never intended for the video to reach a worldwide audience, which makes this mod even more ridiculous. Might have to watch this one quick because it'll surely get taken down for DMCA complaints. The mod comes out at a good time for the Terminator franchise. It has recently been announced that director James Cameron will be picking up the reigns after a long absence. Cameron has said that now is a perfect time to see a new Terminator movie because machines are a more valid threat today than ever. Additionally, excitement has been picking up because Arnold Schwarzenegger revealed that he will indeed, be back with Cameron on the upcoming Terminator movie. And if that wasn't enough, Terminator 2 is returning to theaters this summer for a limited 3D run with a brand new transfer at a full 4k restoration. Terminator 2: Judgment Day 3D will be rereleased in theaters on August 25th, 2017 while there is currently no release date set for the Cameron helmed new movie. 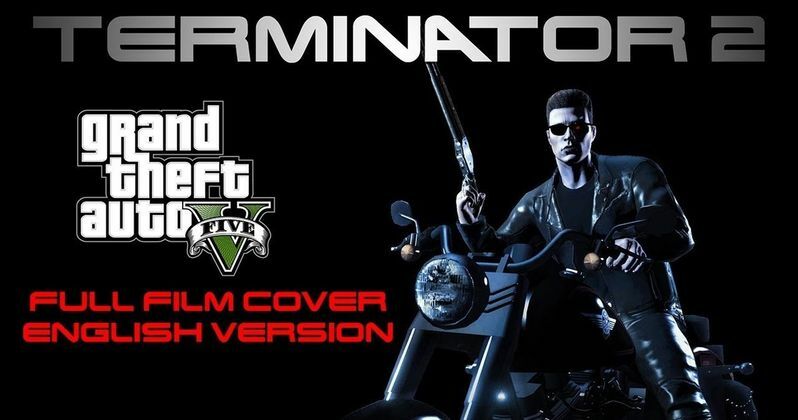 But for now, fans of the Terminator franchise can spend their Memorial Day watching Terminator 2 done in the style of GTA V until it's taken down. Go ahead and see what Hollywood will look like after Skynet takes over below and try not to get too scared.